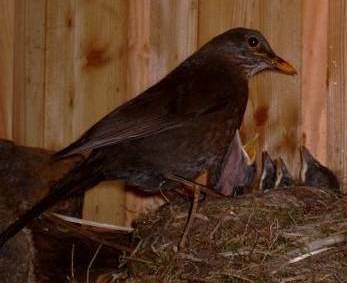 …or: The Tale of the Blackbird that Wasn’t Stupid after all. 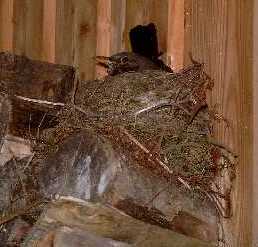 A blackbird is nesting on top of our woodpile. It is taking care of the nest alone: it flies off and leaves it untended. I didn't know they did that. 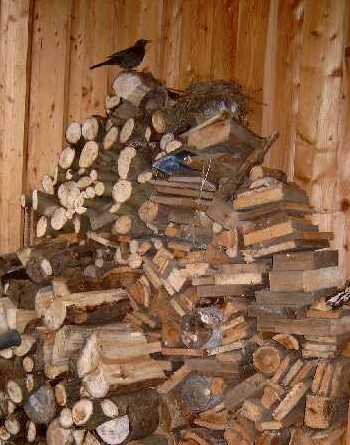 I am also rather surprised that no cat has climbed up the woodpile and killed it. The Consort has a theory: the bird is stupid, and the cats recognise that it is too stupid to be worth bothering with. 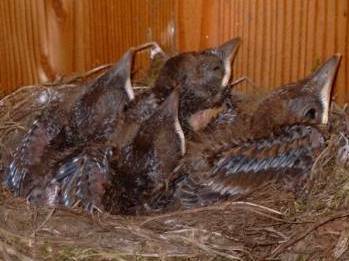 Is it normal for blackbirds to leave the nest untended? Ours does. That's why we assumed she was a lone parent. 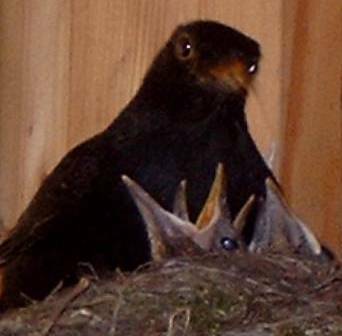 But today I saw a Mr Blackbird with a worm in his beak standing next to the nest. As soon as he saw me he ran off. Maybe that's why we hadn't seen him. But that wouldn't explain the unattended nest. Or maybe he's a new Mr Blackbird. But then why should he help her with someone else's eggs? I am mystified. 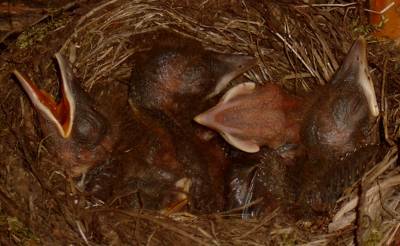 It turns out that the blackbird is not as stupid as we thought: there are at least four lovely little blackbird babies (they look pretty vile, actually) in the nest. Mr blackbird is often around now, bringing home the worms. That would be why he was there the day before yesterday. The chicks are growing proper feathers. Father blackbird doesn't like having his picture taken. In fact, he flies off as soon as he sees anything move. Then he comes a little closer than you would think would be safe, looks at you and squeaks. The idea presumably being that you try to eat him instead of his babies. 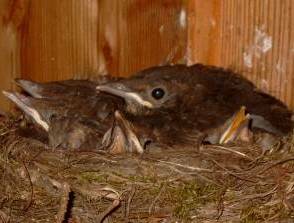 Mother blackbird is more relaxed about things. She's used to people walking around near her by now. I wonder if martens eat blackbirds. 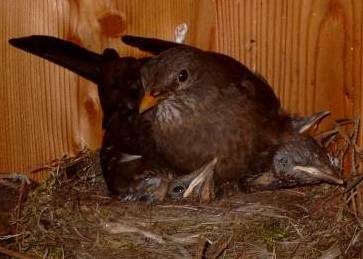 If you come too close to mother blackbird (less than about a metre and a half), then she moves into defensive position, sitting over the chicks. Two days ago they still fitted under her nicely, but now they are bigger. We now have a definite count: there are five chicks. They are growing incredibly quickly. Weightlifters and bodybuilders should consider a diet of worms. Maybe then they could lay off the anabolics. This morning I tricked Father blackbird into letting me take his picture: I waited until he arrived with the worms and hung around waiting for me to go, then hid behind the front door with the camera looking around it. He registered that I had gone and went to feed the chicks. Attempts to sneak the camera around the door from inside had failed because he noticed the movement. By this afternoon he had got used to people wandering around near him enough to stay still while I took his photo without subterfuge. He swore at me a little bit, though. Things are getting pretty crowded in the nest. One of the chicks spends most of its time more or less sitting on the others. I don't know if this is because he is the boss and is opressing the others, or because he is a candidate for being shoved out when there isn't enough room left. When they think they are alone, the chicks sometimes move around a lot, shaking their wings and scratching their armpits with their beaks. As soon as they see someone coming, or even if I just poke the camera around the edge of the shed, they retreat as far as they can into the nest and keep still. On May 14th I came back from a job in Karlsruhe to find the nest empty. 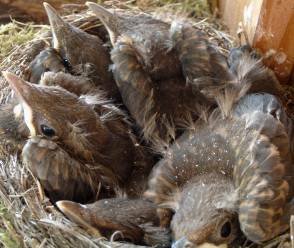 We had final proof that that was no stupid blackbird: the chicks didn't get eaten by a cat, they flew away. That was 2004. 2005 was another story, but unfortunately I've lost all the nice photos of broken shells and the cuckoo.